‘Twas a crisp, sunny Sunday morning…. Granted, it was early, but the mighty Cru had woken from their slumbers and were heading for their date with destiny. Would we get promotion, or would we wallow in the 2nd division again next year? Well, the whole thing nearly turned to custard as the best laid plans were almost thwarted by the Yokosuka Line which decided to throw the proverbial spanner in the works. There’s always bloody something, isn’t there? The meeting time was 08:20, and most of us were late. Not to be put off, we quickly ‘taxied it’ to the ground. And what a beautiful ground it was,… heavens to Betsy, it was green! Ok, it was artificial, but we’ll take it when we can get it. ‘No mucking around’ seemed to be the general feeling and the team got into ‘boots ‘n’ shorts’ and took to the pitch. We proceeded with the warm-up and as the stragglers drifted in they quickly picked up on the mood of ‘down to business’. As with the last game, we felt the luxury of time and space as the whole team were assembled well before kick-off. However just before the kick-off, the team were treated to the strange situation of being in a circle and staring at the ball while Tooley paced around outside, barking out his pregame “Get out there and put this game to bed! !” talk. Maybe it was because, as he owned up to later at the Izakaya, ….. he was reading from his clipboard and didn’t want anyone to notice!? Anyway, the game got off to a cracking start with a sensationally quick try to Travis who silenced the opposition sideline 1 minute in. Then it was an arm wrestle of sorts as All Jinjan pretty much threw everything at us for the next 15 minutes. We could only hold out for so long and we were punished by 2 quick tries against us within 5 minutes. However, even at 7-12 there was no sense of panic in the Cru camp. That sense of calm and “We can do this” attitude resulted in 2 very quick tries 9 minutes later. The first, a well-deserved try to Sean Whaley, who had another storming game in the centres (and seemed to be everywhere), and the second to Brendan Bolton who looked a picture, careering up ‘the fat man’s track’ after picking off a pop pass from Travis. He later confessed that that was his first try….ever ! A couple of minutes later the half came to a close with the score at 21-12 to the Cru. A few half-time changes in the team saw a bit of shape disappear for a few minutes, giving the opposition a chance to capitalize and score again. 2 points the difference – oh, dear. Again, the Cru stayed on attack and were rewarded with a spectacular speculator by Evan the halfback that saw new-boy Brett totally burn his opposite wing and touch the bouncing ball down over the tryline. The euphoria from that was not to last as All Jinjan, fine team that they were, came back at us with a score-levelling try. 26-26, twenty to go…. A sense of urgency had crept into both teams by now. We all knew what was at stake. The tension in the stands was palpable. And to be honest, we have been guilty of letting the game get away on us at this stage on a few occasions this season. But, ha!, it was not to be this time. No siree! The Cru never let them get back into the game after 3 quick tries in the closing 6 minutes. Tom was rewarded for his usual barnstorming bursts and rampaging runs with a try nonchalantly placed under the posts, and Benji bagged a brace. Benji’s first was a right doozy. A real heartstopper, and somewhat comedy-like in the way it unfolded. Quick hands on attack out the backline saw Brett with ball in hand, and a clear run to the line a metre or 2 away. For reasons inexplicable at the time, he flicked it on to Benji on his outside, who was prematurely in the rapturous throes of celebrating by clapping his hands. A heart stopping fumble was the result but he miraculously fell over the line and, 5 more points. On being asked why he didn’t score the try himself, in typical Kiwi fashion, he said “Well, I didn’t want to take too much glory on my first time out”. Well Brett, next time out, take as much glory as you like! With 5 out of 7 conversions put away by Evan, the final score was an inspiring 45-26. So many of the guys were playing out of their skins, unsung heroes the lot, but special mention must go to the front row, fellas like Mo, Andy, Marc, and later Stew and Kyle who had a series of powerful runs up the centre that appeared to knock the stuffing out of the opposition, who seemed to tire a little at the end. Also, special mention must be made of the backs, who never gave up on chasing and bringing their man down. And once again the mercurial Travis was awarded the opposition team’s ‘man of the match’….he also got our vote. Finally Tooley just couldn’t resist a bit of the old Crusaders tradition by sneaking in an Oogie, oogie, oogie! after the formalities. A sore looking Cru bussed it back to the station and proceeded to Yokohama where another ‘Henwood for 25’ had been organised. All in all, a bloody good day, and a bloody good team. Well done, chaps. 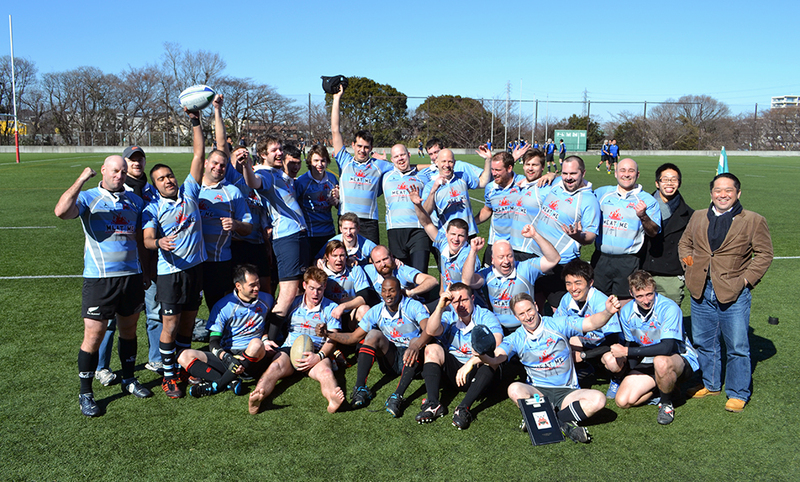 Thanks to everyone who has supported us throughout the Shuto League 2012/-13. We are now in Division 1!